Hidden in the corner of quaint Piazza della Passera, this tiny gelateria hand makes its daily creations from its kitchen out back. Offering a range of both milk-based and sorbet offerings, it’s perfect for people who are lactose intolerant. In summer, favorites include zesty Mojito infused with lime and mint, or in the winter try nutty pistachio or velvety crema. On the other side of town, Gelateria dei Neri is neatly positioned at the end of this medieval street filled with panini joints and café bars. Under a glistening counter they serve an array of flavors with chocolate and noci (nuts) or mandarin and mint, plus a delicious display of deserts, including tiramisu, to be tempted by. This gelateria was opened in 1990 by twin brothers Massimo and Roberto, and is fast becoming a favorite with both locals and travelers alike. Artisanal ice cream is made daily onsite, with cheesecake a personal favorite. A second outpost opened over the Arno River in Santa Croce on via dei Benci (24r), so now you have no excuse to try a cone on either side of the city. A block down the river Arno heading east, Gelateria Santa Trinita is another favorite all year round. Take a cup or cone filled with rich chocolate fondant or sesamo nero(black sesame seed) and sit on the bridge of Ponte Santa Trinita to take in the sweeping views of Florence and its famed bridge, Ponte Vecchio, whilst delving into your gelato. The store also has a small adjoining shop for Tuscan chocolates, wine and condiments. 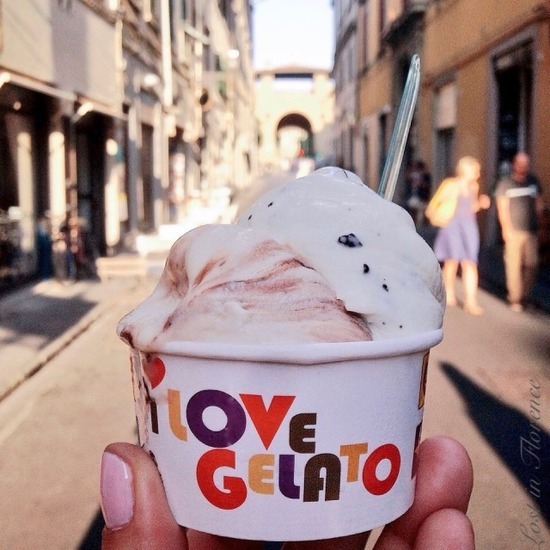 This hole-in-the-wall gelateria in San Lorenzo has mouth-watering flavors from crunchy stracciatella (chocolate chip) to fruity flavors such as fragola (strawberry), or if feeling adventurous, try matcha (green tea) from only €1.50 a scoop. It’s a great shop for a sweet stop after visiting the famed leather markets in this neighborhood. It’s the smell of the freshly baked waffle cones which first hits your senses. Then you are drawn in to this small gelateria opposite Florence’s imposing Duomo to explore the organic gelato on offer housed in steel tubs. Try Il Gianduia secondo Edoardo (hazelnuts and chocolate) or in summer, try the sweet peach that uses not only the fruit but all the skin for maximum flavor. This gelateria/café in San Niccolo makes their sweet treats onsite then housed under the silver lids of the ice cream pots. You can see the gelati being made by hand in their backroom with employees at work in the mezzanine kitchen. They also serve hot drinks including hot chocolate in the winter, which you can sip reclined on one of their sofas in the cozy café that also offers free wifi. Opening in summer 2015 to much local applause, this small shop offers seasonal scoops of soft, sweet gelato from only €2 a cup. Run by husband and wife team, Alberto and Julia Bati, who pride themselves on seasonal and “made fresh daily” products. Try a classic like dark chocolate, or in summer opt for a fruity flavor like watermelon or zesty passionfruit. Hidden away in the very local yet central neighborhood of San Frediano, La Sorbetteria opened in 2007 by Antonio Brustolon with his wife Elisa. With a family history in gelato making (the Brustolon family has been making it since 1934), Antonio prides himself on producing the best flavors using only quality, local ingredients with recipes handed down through the generations. On a quiet lane a few blocks from bustling Ponte Vecchio, Carapina is a hidden gem among this touristic area’s industrial “rough”. The second outpost of this artigianale gelateria (the first opened in 2008 in the residential neighborhood of Campo di Marte) prides itself on handmade, seasonal and super fresh ice cream (try the Vin Santo) made daily from their onsite laboratory.